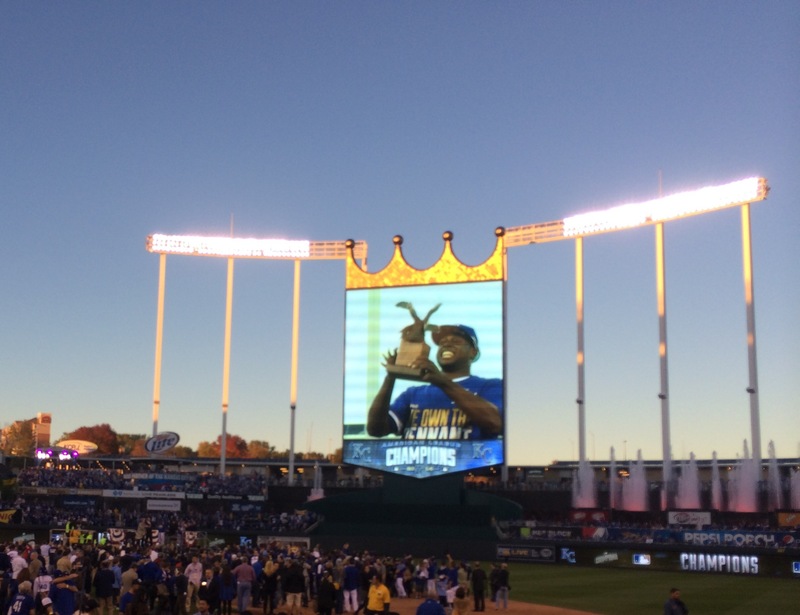 The Kansas City Royals are American League Champions, and Lorenzo Cain, a.k.a. 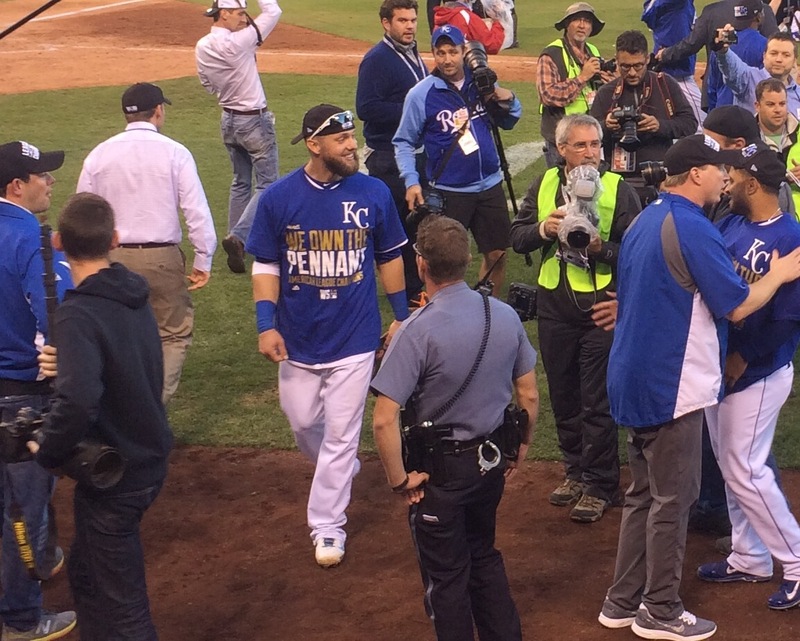 “My Boi” was named ALCS Most Valuable Player. Well, there are, or there will be, but now that this series has wrapped up I should probably take some time to catch up on my seminary work. We’ll revisit probably on Monday morning, but for now some photos will have to suffice. 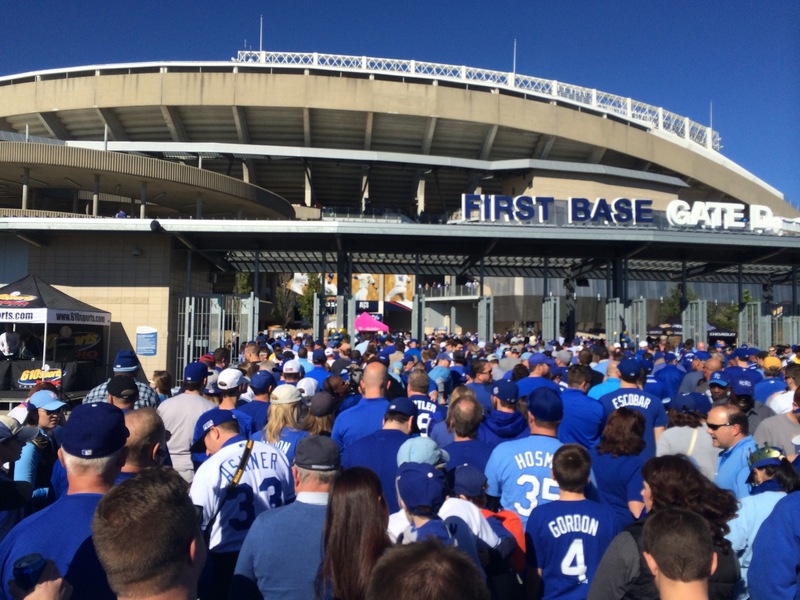 Entering through Gate D. I started a “Let’s Go Royals!” chant that spread to at least 30 people and lasted at least 12 seconds. 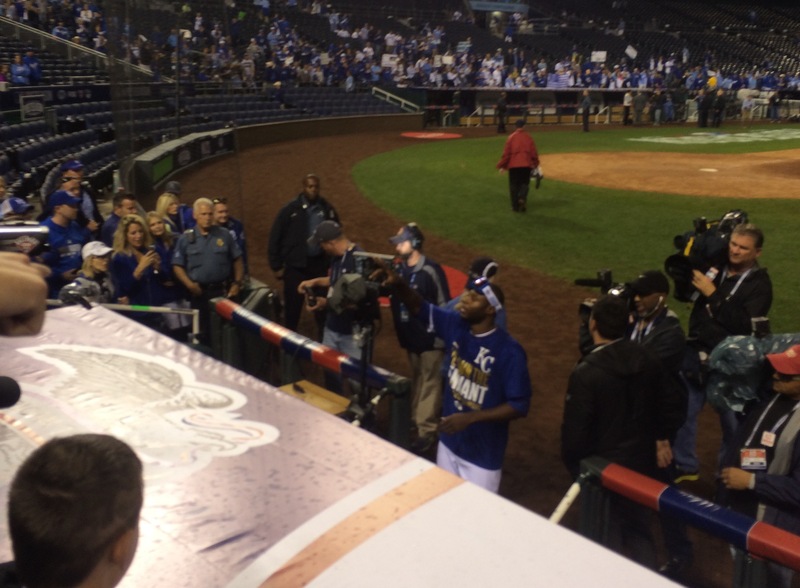 ALCS MVP and Nori squat. 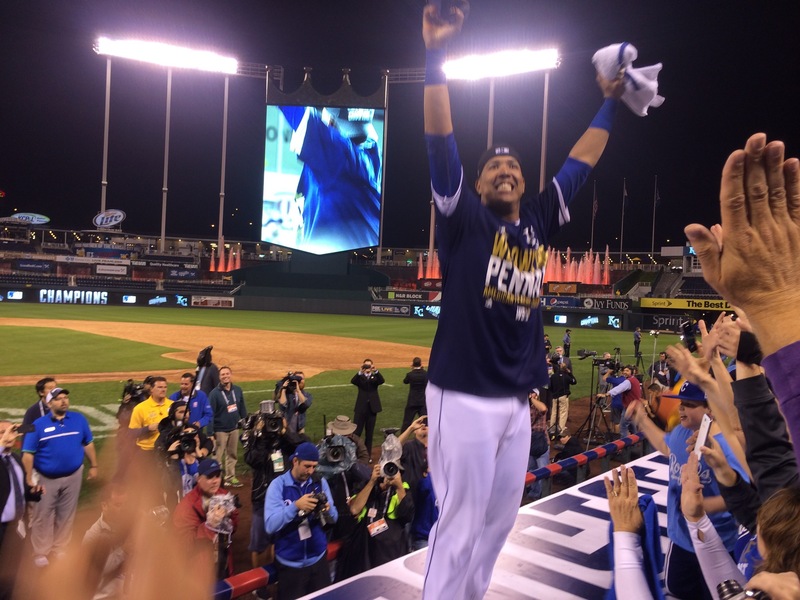 Alcides Escobar broke up a play at the plate scoring he and Aoki. 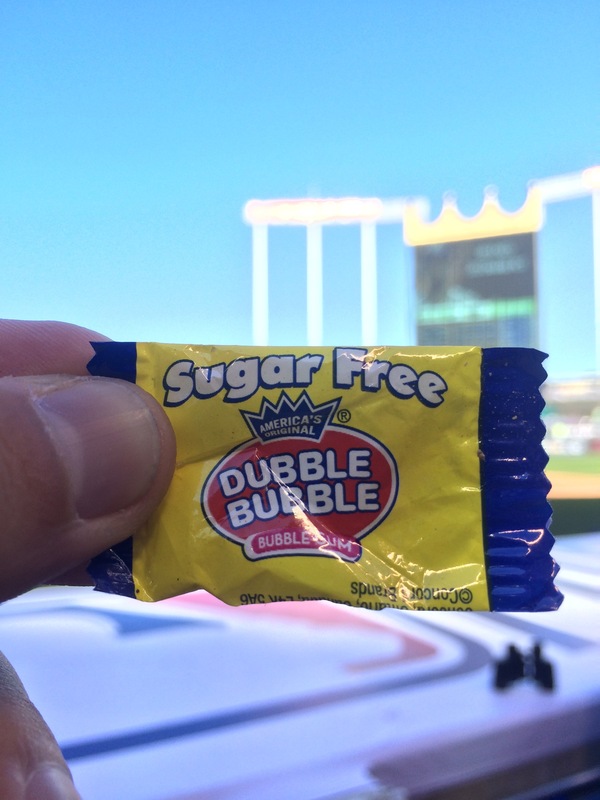 Jarrod Dyson goes full parade mode and starts chucking handfuls of bubble gum out of the dugout and into the crowd. I saved mine for a postgame celebration. 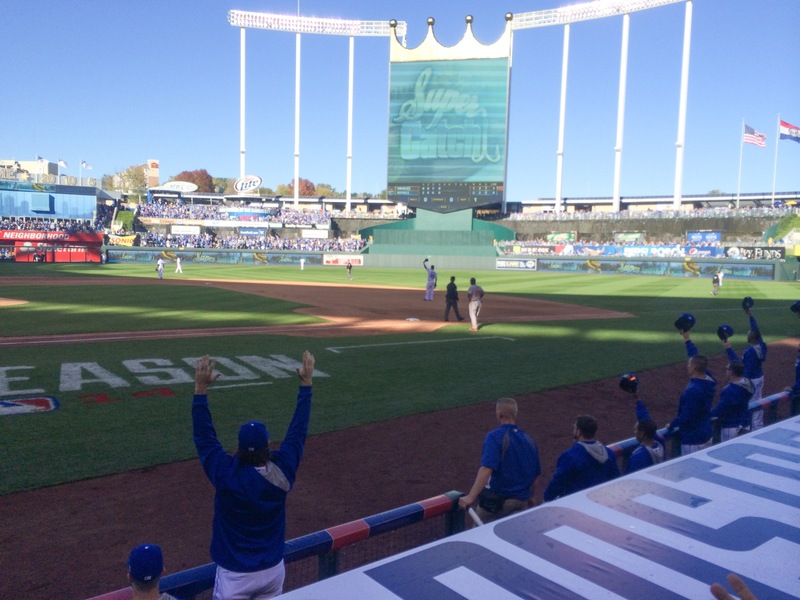 The dugout went nuts after Gordon’s catch against the wall in left field. Lots of cap tips on this team. 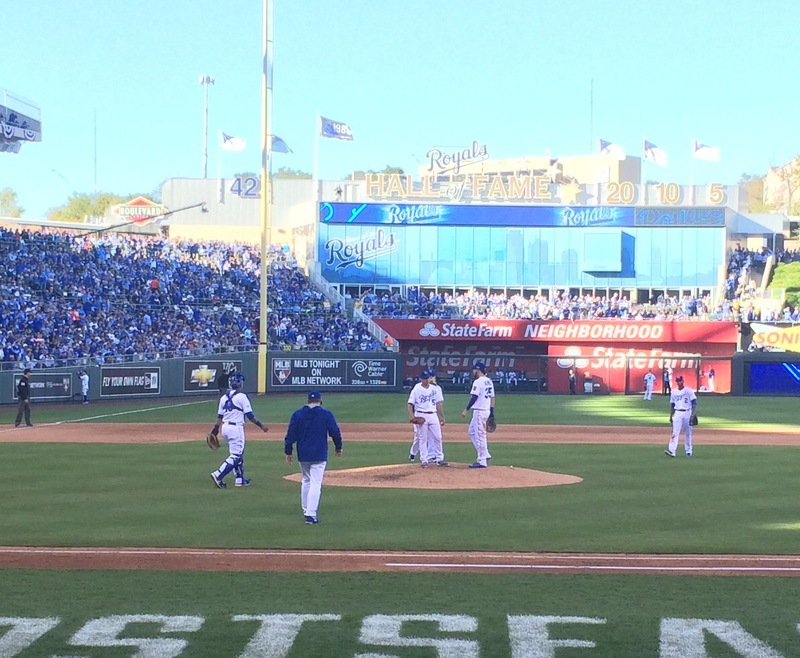 Jason Vargas pitched very well. Ned pulled him for Herrera after 5.1 innings of 2 hit 1 run ball. 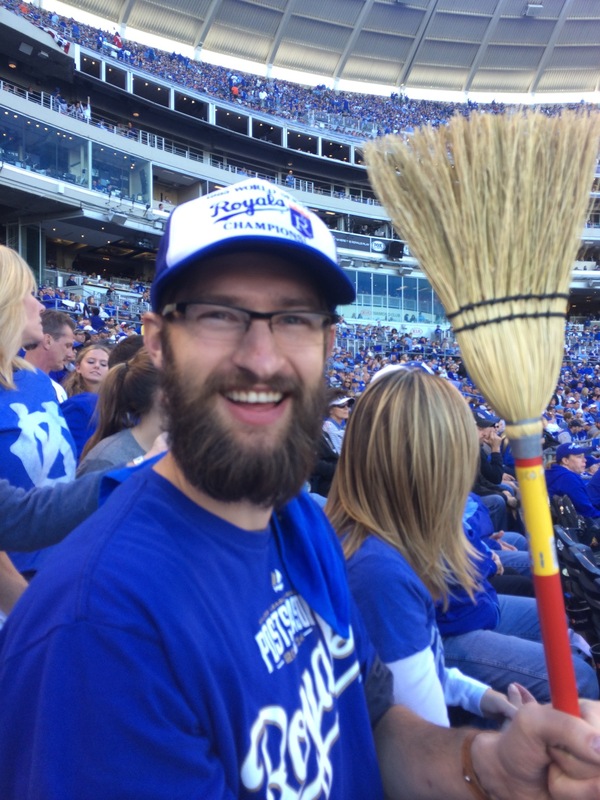 This has been The Wade Davis Experience. Another day at the office. 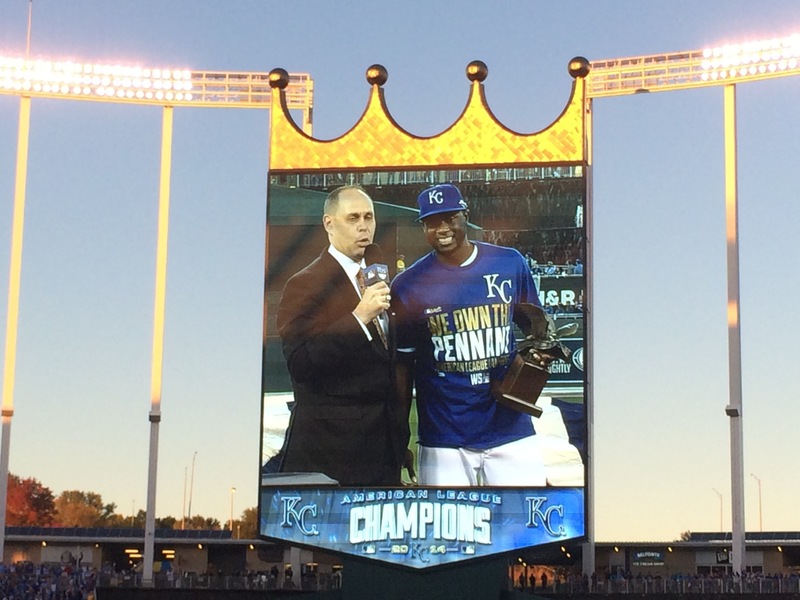 Royals should’ve capitalized here and didn’t. 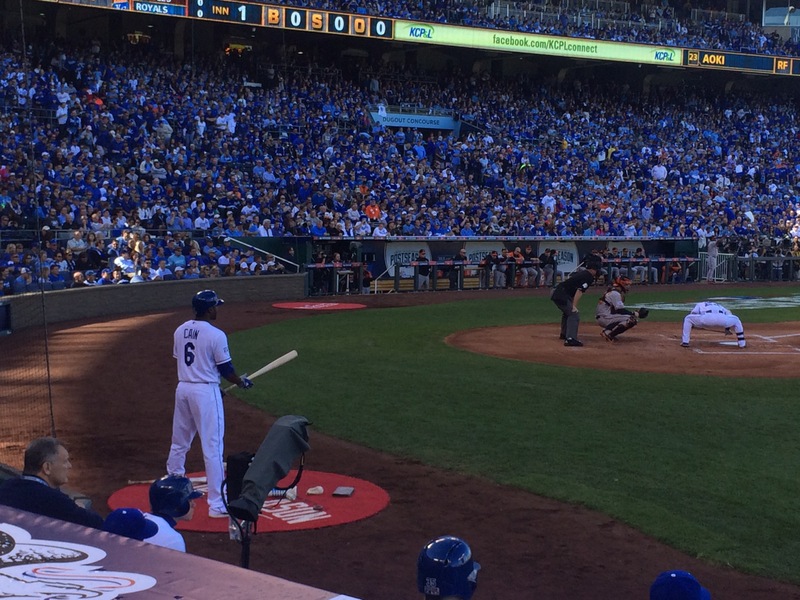 Billy Butler lead off double (not pictured), Terrance Gore in to pinch run (pictured), Alex Gordon comes up. 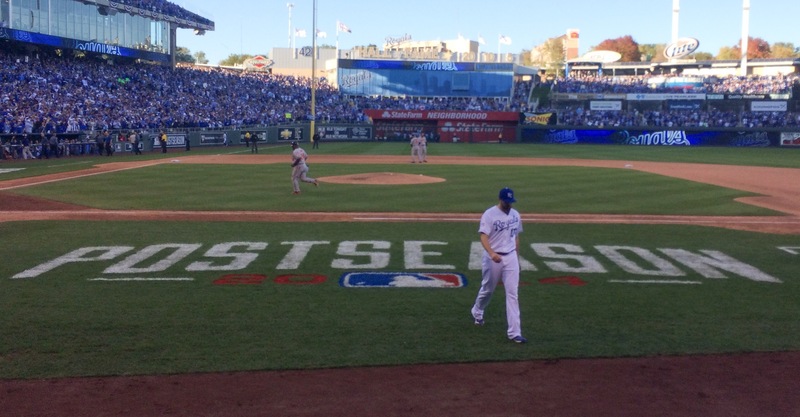 For a guy who loves to bunt, Ned Yost sure ignored a perfect time to move up Gore to third. 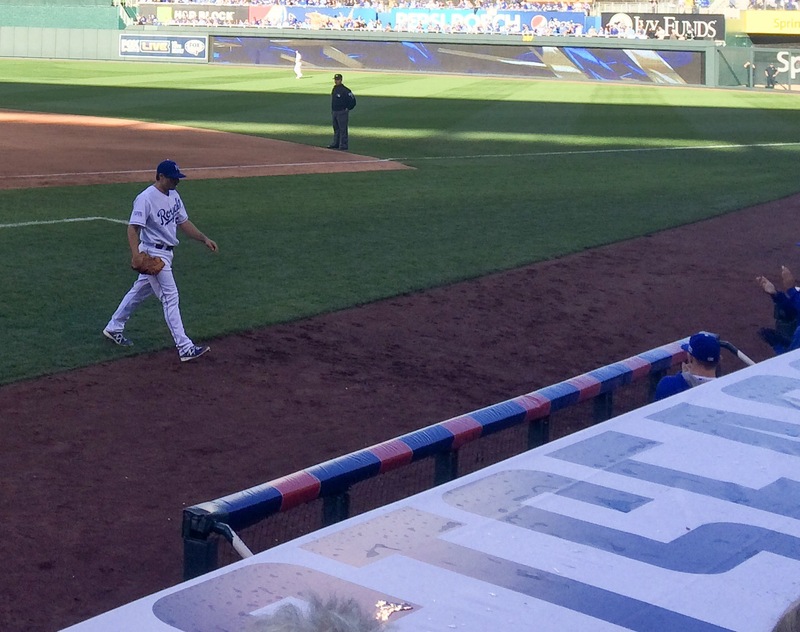 If Yost had, Gore would’ve scored on Salvy’s next at bat. An insurance run would’ve been nice, but 2 > 1 too. Then this guy showed up. Thinks he can just stand anywhere he wants to because he’s got a big ole camera. my footage was probably better (see above) anyway and my camera fits in my pocket and makes phone calls too. 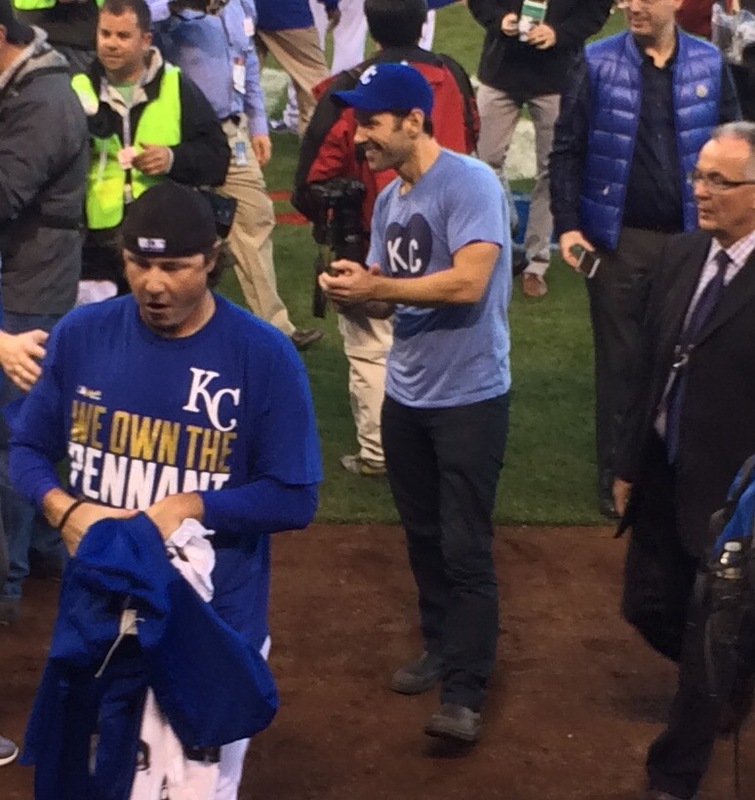 Paul Rudd celebrates. No word yet on whether the party at his mom’s house actually happened. 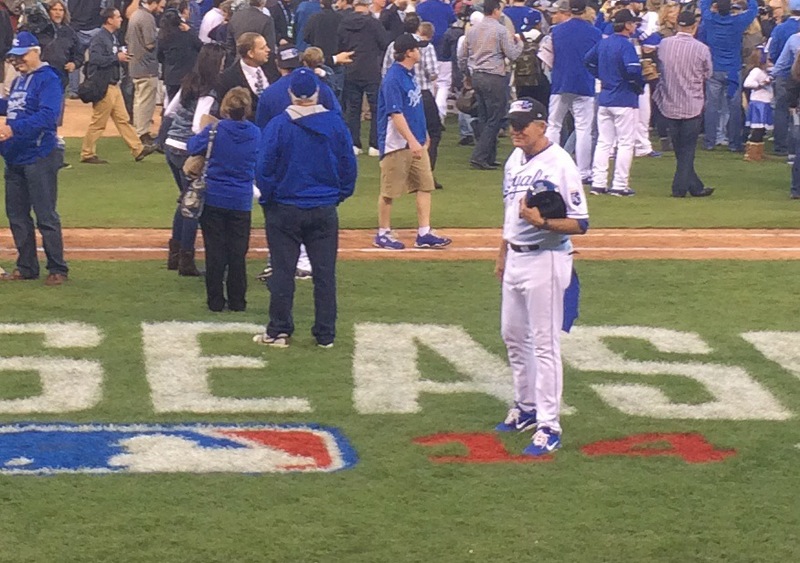 Rusty Kuntz awesome moment of the night: about 10 minutes into the celebration, Rusty looks over and spots the three ball boys standing in the dugout watching the fun. Rusty walks over and motions for them to join. A security guard objects, but Rusty plays his “don’t you know who I am?” card and the boys light up and rush out on to the field, group-hugging Kuntz on the way. Terrific. 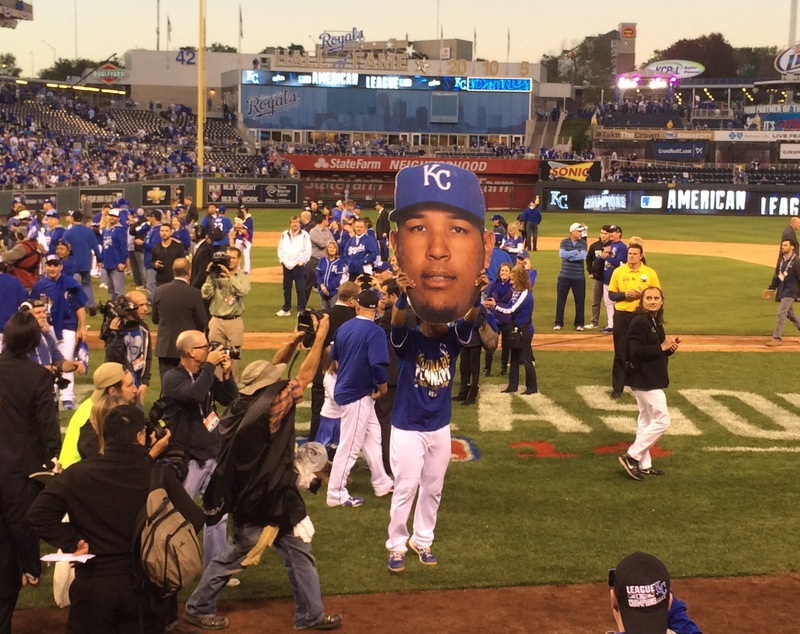 Salvy traded his Champs cap with a fan for his own giant face. 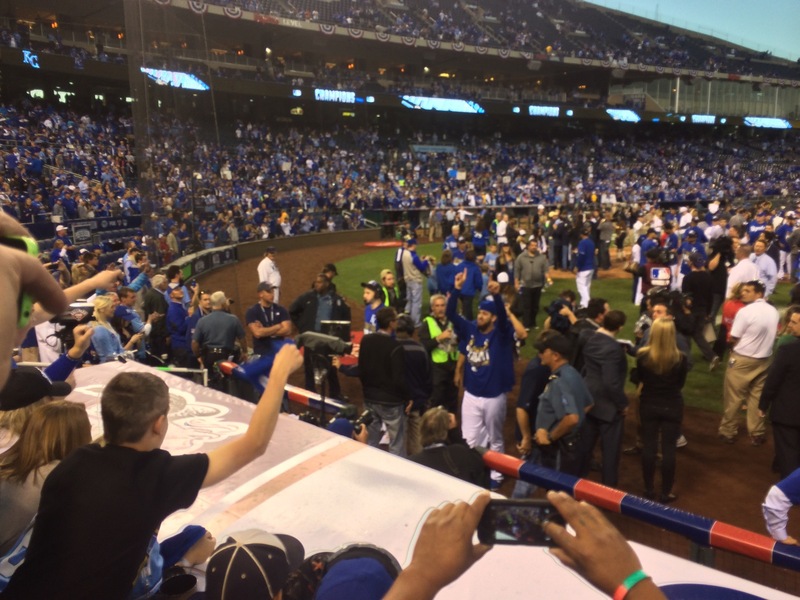 Then Salvador Perez jumped on the dugout and hugged a kid. 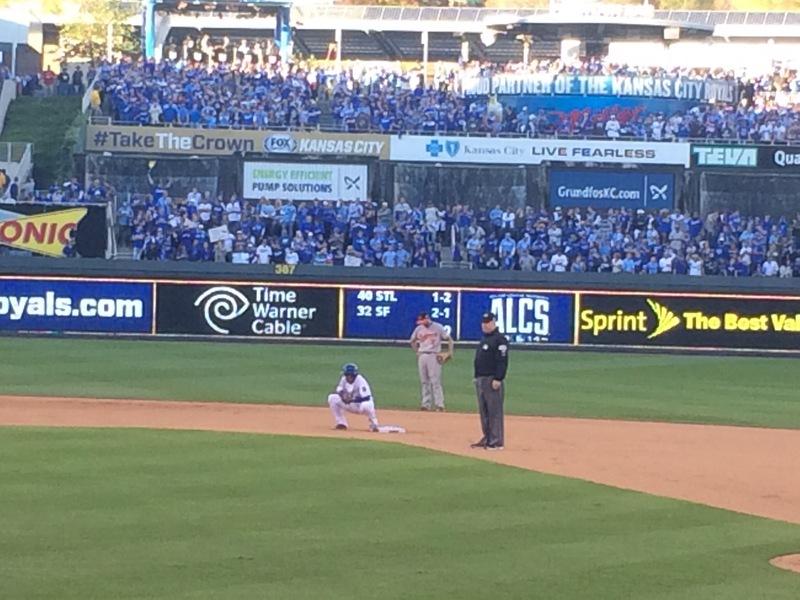 Salvy initiated. Then he hugged another kid. 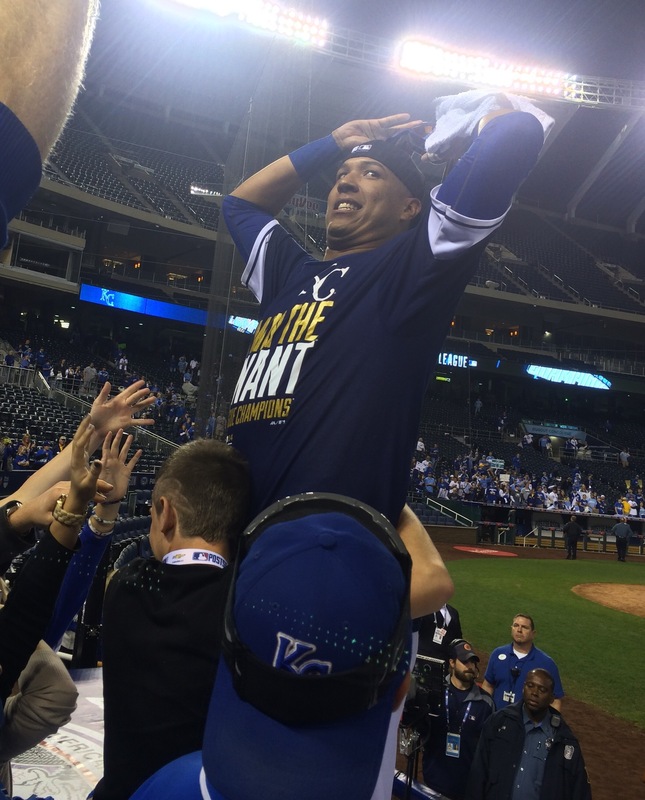 Salvy did NOT initiate. …we weren’t the only ones. 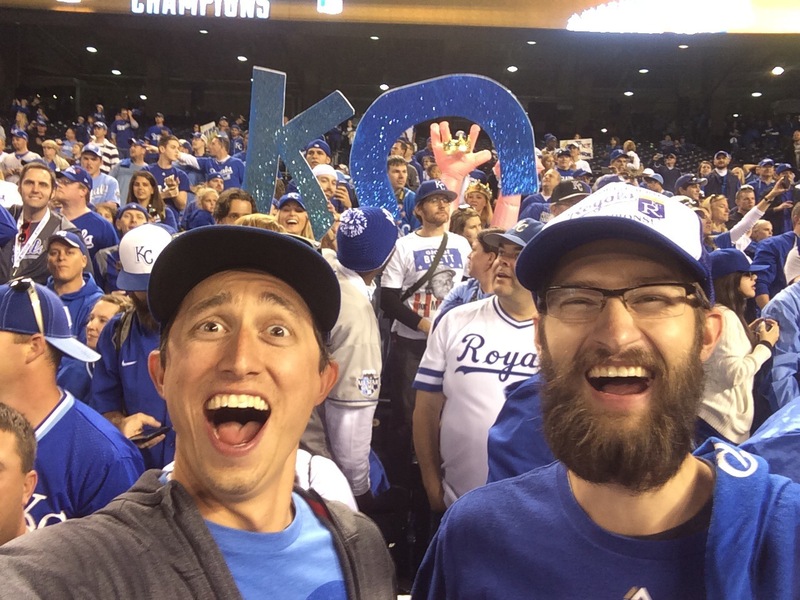 So long for now, Kauffman. 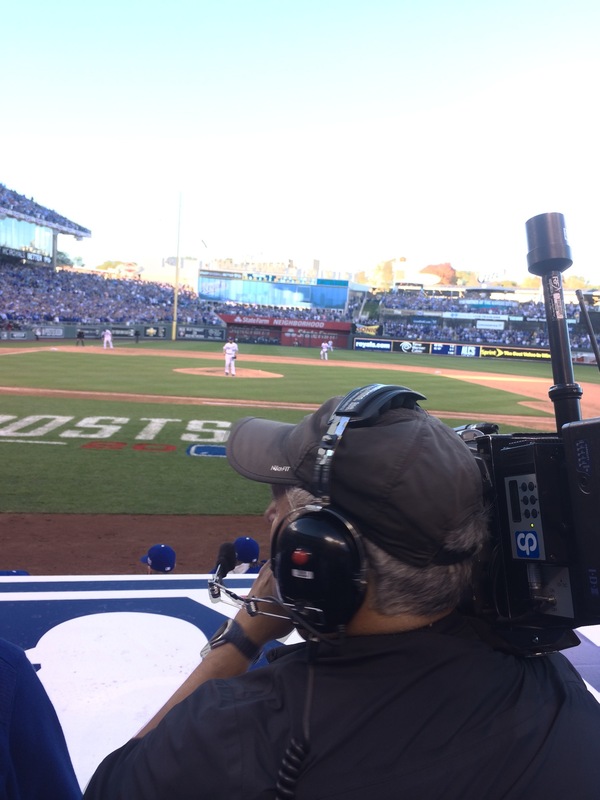 See you Tuesday for Game 1 of the 2014 WORLD SERIES. 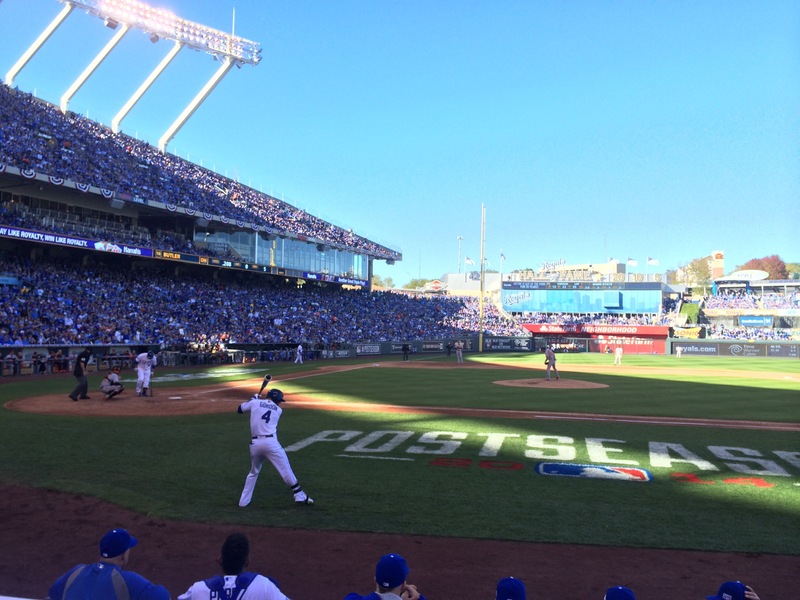 Previous Previous post: ALCS Game 3 Primer: Jarrod Dyson’s comments/confidence, why Jeremy Guthrie, and revisiting predictions. 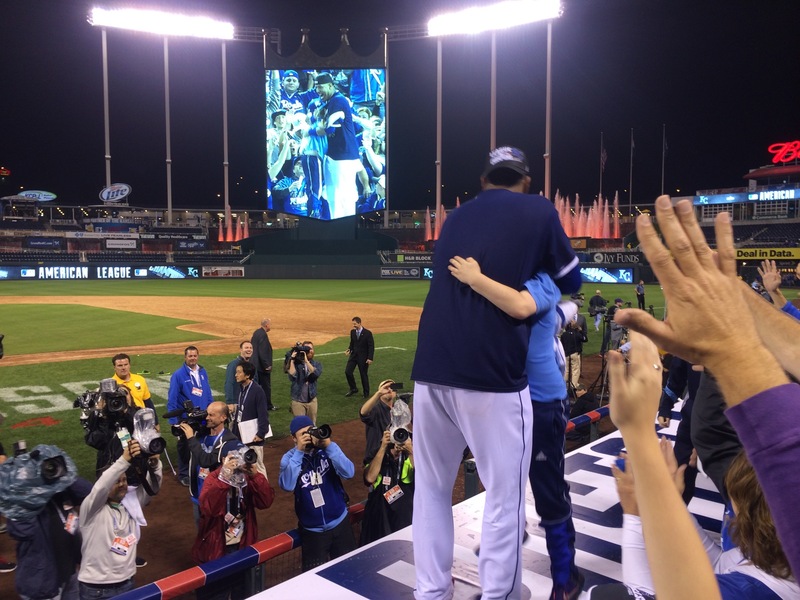 Next Next post: World Series Primer & Predictions: If baseball is designed to break your heart, why does KC feel like THIS?